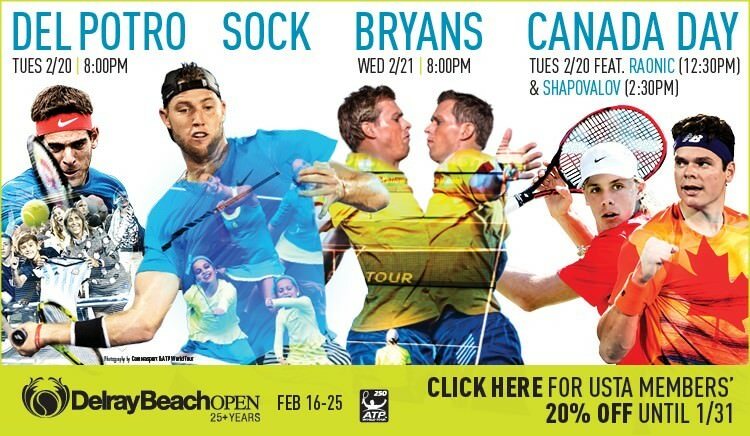 The 250 stop in Delray Beach is event #2 on the USA’s ATP World Tour Schedule for 2018. Here is your full preview and predictions for this outdoor hard court tournament. Top seed Jack Sock faces journeyman J.P. Smith in the opening round. Sock badly needs some wins but should have a tough customer in Ryan Harrison awaiting in round 2. Harrison needs to defeat American wild card Reilly Opelka in the opening round. Caught up in accusations of racism last week in New York, Harrison’s head may be somewhere else and I’ll go with Sock to find form and continue to demonstrate why he’s the American #1. John Isner is struggling and faces an opponent he just lost to in New York, Radu Albot. As unlikely as it may be, I’ll go with Albot to defeat Isner again before falling to Peter Gojowczyk/Lukas Lacko in round 2. Isner is way out of sorts. Sock over Gojowczyk is my pick in the quarters. New York Open champion Kevin Anderson faces Evgeny Donskoy in the opening round. Donald Young/Ramkumar Ramanathan will follow. Anderson should be the favorite until he reaches the quarters. Milos Raonic should await at that stage. The Canadian is hoping to make a solid showing after struggling to start the season. Raonic faces Taro Daniel, Nikoloz Basilashvili/Steve Johnson will follow. I’ll back Raonic to reach the quarters and upset a tired Anderson at that stage. Juan Martin Del Potro vs. Hyeon Chung is a potential quarterfinal matchup that fans will be eager to watch. Del Potro opens with Jeremy Chardy, Matt Ebden/Frances Tiafoe will follow. Chung opens with Cam Norrie, Franko Skugor/Alexander Bublik will follow. I’ll go with Del Potro to power past Chung. Both players are solid, but Del Potro is tough on a hard court. I’ll back Canadian Denis Shapovalov to have a solid tournament. Shapovalov will have to get past Ivo Karlovic, but presuming he wins that match he’ll get Jared Donaldson or a tired Adrian Mannarino in round 2. New York finalist Sam Querrey faces Taylor Fritz, Dudi Sela/Mikhail Youzhny will follow. Shapovalov over a tired Querrey is my quarterfinal pick. I’ll back the veterans Milos Raonic and Juan Martin Del Potro to build confidence and reach the final in Delray. Del Potro is my pick for champion. Nick Kyrgios became one of the youngest ATP champions of all-time when he captured the title in Marseille at the age of 20. Kyrgios dominated a tough field and didn’t drop a set, as he concluded his tournament triumph with a 6-2 7-6(3) victory over Marin Cilic. Kyrgios’s serve and return of serve were both clicking this week as he defeated Vasek Pospisil and Teymuraz Gabashvili 4 and 4, Richard Gasquet 6-0 6-4 and the powerful Tomas Berdych 6-4 6-2. Gasquet was still nursing a back injury, but nobody could stop NK from rising this week. The young Aussie has already demonstrated his ability to win big matches and do well in slams, but his ranking should rapidly improve if he can win more ATP titles and compete on a weekly basis. Kyrgios lost his only previous ATP final last year. Cilic reached his first ATP final of the season as he slipped past Robin Haase in three sets, Andrey Kuznetsov in straights, and Benoit Paire in a close three setter. Paire upset Stan Wawrinka in the previous round. The former Grand Slam winner is showing signs of improvement, but still hasn’t reached the same level that he was once at and remains outside the top 10. Mate Pavic and Michael Venus combined to win their third ATP doubles title of the season over Colin Fleming and Jonathan Erlich in a routine doubles final. Pablo Cuevas won his fourth career ATP title, and his first ever at the 500 level in a tight three setter over surprise first-time ATP finalist Guido Pella 6-4 6-7(5) 6-4. The Rio tournament was plagued by both rain and upsets this week, but the dirtballer Cuevas was a true warrior and had the week of his life in Rio. Cuevas dominated Facundo Bagnis in his opening match, then fended off a challenge from upstart wild card Thiago Monteiro, and beat Federico Delbonis in straights. He faced Rafael Nadal in the semis and stunned the king of clay in three sets, with two tiebreaks. The match against Nadal was his first ever top 10 win on clay, as Nadal continues to struggle and decline. Nadal wasn’t the only big name to lose in Rio this week, Jo-Wilfried Tsonga was stunned by the ATP débutante Monteiro. The Brazilian has a bright future ahead. Pella was down match point in round 1 against a cramping John Isner, but won a third set tiebreak to survive and advance. The Argentine built on that big win and beat Santiago Giraldo and Daniel Gimeno-Traver, the latter in three sets, to reach the semis. Dominic Thiem was playing and doubles and singles this week and suffered from exhaustion as he was rolled over by Pella in a semifinal upset. Juan Sebastian Cabal and Robert Farah won the doubles title for the second week in a row on the Golden Swing. The Colombian duo defeated David Marrero and Pablo Carreno Busta. Sam Querrey won his eighth career ATP title and his first in four years in Delray Beach. The American has had his best success on home soil and his latest triumph came over countryman Rajeev Ram 6-4 7-6(6). Ram was playing in his third career ATP final, as the journeyman has made surprising success with his serve and volley game. Querrey, who was coming off the semis in Memphis, has been in great form as he recovered from dropping the first set to Thiemo de Bakker to win in three sets, going on to defeat Austin Krajicek, Tim Smyczek in a tight three sets, and surprise semifinalist Juan Martin Del Potro in a close two sets. Del Potro lacks a solid backhand, but his trademark forehand was looking sharp in his first ATP comeback tournament. The Argentine successfully won three ATP matches this week, and his fans can hope for more going forward. His serve also seems improved. The 31 year old Ram took advantage of Bernard Tomic’s tank, and won three setters over Illya Marchenko and Benjamin Becker before shocking Grigor Dimitrov in the semis. Ram didn’t play out of the ordinary, but Dimitrov was reckless and erratic. Oliver Marach and Fabrice Martin survived being down match point six times to defeat the legendary Bryan brothers for the Delray Beach doubles title. Posted in: ATP, Delray Beach, Guest Writer, Interview, On Site. 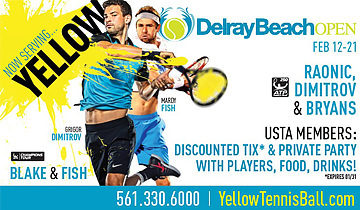 Tagged: 2015 Delray Beach Open, Delray Beach Open, Delray Tennis, denis kudla, Denis Kudla Interview, kudla, tennis. Clean ball striking American Denis Kudla has always been a popular player here at Tennis Atlantic. Now 22, Denis has started his 2015 campaign in good form. Yesterday he comfortably defeated Lukas Lacko of Slovakia in straight sets in the opening round of Delray Beach, and he’s already qualified for two ATP World Tour events this year in Brisbane and Memphis with notable wins over Viktor Troicki, who has already won an ATP title this season, and young Aussie Thanasi Kokkinakis last week in Memphis. Kudla also pushed top 15 player Feliciano Lopez to a match point down in a 5 set Australian Open epic, and he’s working hard to get himself back into the top 100. Denis was kind enough to chat with our on-site writer Jessica Luzadas after his round 1 win in Delray, discussing his recent results, the upcoming USA-GB Davis Cup tie, the Lopez match, other young American players and more. Our thanks to the Delray Beach Open and the ATP Media Director for their assistance in obtaining the interview, and of course to Denis himself!